Paramount Pictures has released the first poster for The Spongebob Movie: Sponge Out of Water 3D, the studio's follow-up to their 2004 animated hit The SpongeBob SquarePants Movie. The one-sheet gives a nod to the famous Coppertone ads from the 1950s, where a dog was seen pulling the bikini bottom off of a young blonde girl. 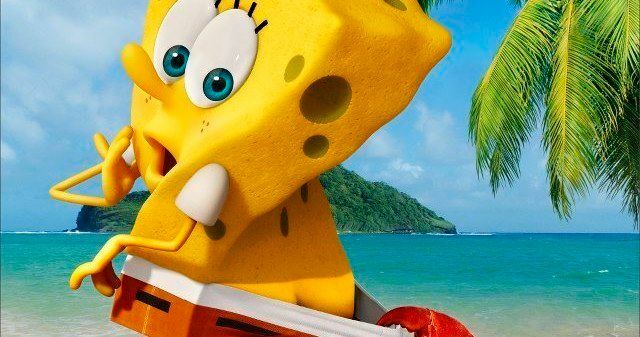 No plot details have been released at this time, but Tom Kenny, Clancy Brown, Bill Fagerbakke, Rodger Bumpass Mr. Lawrence and Carolyn Lawrence are reprising their voice roles from the SpongeBob SquarePants TV series. With the debut of this poster, the trailer could be just around the corner, so stay tuned for the first footage.